A Christian family survived two years of terror living under Daesh (ISIS), in an interview with ACN they describe their experiences at the hands of the extremists. A Christian mother and son in Iraq have told their story of survival after two years of terror living under Daesh (ISIS). 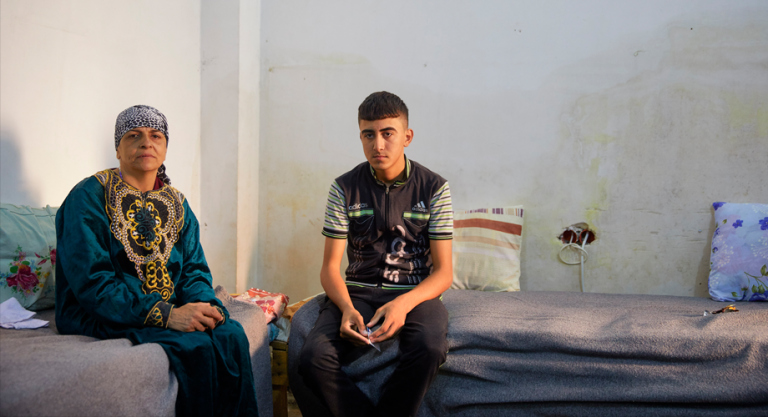 In an interview with Catholic charity Aid to the Church in Need, widow Jandark Behnam Mansour Nassi, 55, and her son, 16-year-old Ismail, describe their experiences at the hands of Daesh extremists. Ismail, who the militants jailed, recounts seeing gun-wielding Jihadi children kill orange-clad Daesh prisoners and how he witnessed a woman bound hand and foot being stoned to death. The teenager goes on to describe how Daesh threatened to kill him if he refused to convert to Islam. He recalls the pain of later converting to Islam against his will and how he went to a Daesh “correctional camp” where the Jihadi militants tried to force him to marry in spite of him being only 15 at the time. When Daesh found the cross he was wearing round his neck, they beat him and he was hit again when he was unable to answer questions while being forced to study the Qur’an. Ismail’s mother was “stung with long needles” for her failure to study the Islamic sacred text. The climax of their account comes after the two were abandoned by Daesh forces. They tried to get away but were caught again. When they made a second bid for freedom, they came under Daesh sniper fire. They took cover in a house and when they appeared waving a white flag they were rescued by forces fighting Daesh. Two months later, mother and son are in Erbil, the capital of the Kurdish Autonomous Region, in northern Iraq, where Aid to the Church in Need is providing pastoral and emergency aid. It is in Erbil that this ACN interview took place. Ismail fled the Iraqi city of Mosul with his mother Jandark Behnam Mansour Nassi (55), they have taken refuge in Erbil, in the Iraqi Kurdish Autonomous Region. “Another time I ran into a big crowd on the street. There was a woman; her hands and feet were tied. The Daesh terrorists drew a circle around her. If she got out of the circle, she would live, but that was impossible because she was tied. While her relatives were crying and begging for a pardon, the Jihadists threw stones at her until she died. “My son was forced by Daesh to practise Islam and I was tortured for not knowing anything about Islam and the Qur’an,” says his mother, Jandark. “Yes, I am embarrassed for having had to profess Islam,” affirms Ismail. “Daesh warriors made me pray,” says Ismail. “I received a prayer rug on which I could call upon Allah. Men were obligated to pray in the mosque on Friday. Anyone who would walk on the streets during the Friday prayer would be beaten. In the mosque, we were told that Assyrians were evil and that Christians did not believe in the right way. My mother should have to pray at home but she did not pray to Allah. “One day we heard that Qaraqosh – another Christian village in the Nineveh plain occupied by Daesh – had been freed, and that the liberation troops had chased the Jihadists out of Bartella. Soon after that, the air attacks on Mosul started, and many people fled. Daesh also fled and, in the hurry, even left some weapons. However, they did take people with them on their way through Mosul, including my mother and me. For three days, we were under the control of a Jihadist. Aid to the Church in Need has supported the Christian refugees in Erbil and Baghdad with more than £19.6 million since the outbreak of the crisis in August 2014. Among the most important projects are the food programme for internally displaced people (IDPs) from Mosul and the Nineveh Plain, which benefits up to 13,000 families, and a housing scheme for about 1,800 Christian IDPs in Kurdistan. ACN is appealing for donations to provide ongoing food, heating, clothing and shelter during the winter months.